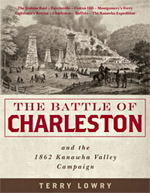 The Battle of Lewisburg, by Richard L. Armstrong, is now available from 35th Star Publishing. The early morning hours of May 23, 1862 brought the horror of war to the residents of the small, mountain town of Lewisburg, Virginia (now West Virginia). A brigade of Union troops, commanded by Colonel George Crook, had occupied the heavily Confederate leaning town less than two weeks earlier. Now, Lewisburg felt the fury of a battle waged in her streets. Bullets flew in every direction. Cannon balls whistled overhead and occasionally struck the homes and other buildings of the town. Confederate soldiers, some of whom grew up in Lewisburg, fought and died in their hometown. A few hours later, 240 Confederates were killed, wounded, or taken prisoner. The victorious Union troops suffered the loss of 93 men killed, wounded, and captured. Confederate Brigadier General Henry Heth, with a superior force, now found himself forced to retreat in complete disarray. Colonel George Crook would soon be promoted to brigadier general, largely because of his conduct at Lewisburg. This carefully researched book by historian and author Richard L. Armstrong contains 248 pages, 34 images, and 13 maps (including a detailed map of the town the day after the battle by Captain Hiram F. Devol of the 36th Ohio Infantry). 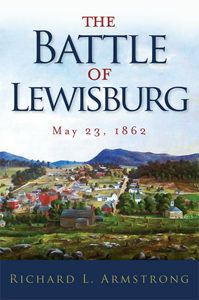 The cover features the beautiful painting of Lewisburg in the 1850s by renowned landscape artist Edward Beyer. Lewisburg, now a part of the state of West Virginia, is the county seat of Greenbrier County, and is named for Revolutionary War period General Andrew Lewis. A previous winner of the “Coolest Small Towns in America” award, the town offers many quaint shops, restaurants, galleries, and other attractions. Walking tour brochures, including one focused on the Battle of Lewisburg, are available at the Greenbrier Valley Visitors Center, located downtown on the corner of Washington and Court Streets.